With my wife Pamela having been born in New Jersey, U.S., she was very curious to find out what the ‘original’ Jersey was like. There was nothing left to do but for us to go and find out! Living in Scotland, there are direct flights to the island of Jersey, so it was a simple trip for us to make. Jersey is part of the Channel Islands, which are located in the English Channel between the south English coast and the north French coast. It gets a little bit confusing, but the Channel Islands are British Crown Dependencies and are not actually part of the United Kingdom or the European Union. However, the islands defence and foreign affairs are represented by the British government. This rather unusual arrangement has meant the Channel Islands are of unique character and have a mix of European cultures. 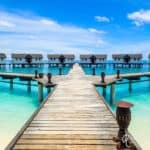 Being a small island, only 100 km2, it is very easy to cover the whole isle, and with a population of just over 100,000, the place never feels crowded – except on a sunny day on one of their superb beaches! Elizabeth Castle – Elizabeth Castle dates back to the 1590s and is crammed full of history. We learned about the governorship of Sir Walter Raleigh and how the castle gave King Charles II refuge during the English Civil War, all the way up to the part it played during the Second World War. Plan to spend most the day here, and make sure you check out the ancient Hermitage on the southern side of the castle. At low tide, the castle can easily be walked out to and when the tide comes in, you can ferried around by an aquatic bus! 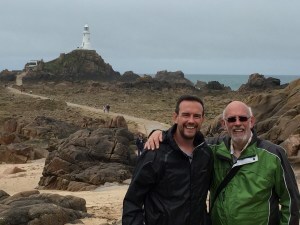 Corbiere Lighthouse – Being an island, Jersey has its fair share of beautiful coastline, and none more so than the small, rugged Corbière peninsula, which is topped off by the picture postcard lighthouse. The causeway out to the lighthouse gets cut off by the tide, so make sure that you aim your visit for low tide. An interesting fact is that the lighthouse, built in 1874, was the first in Britain to be built of reinforced concrete. 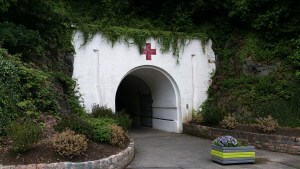 Jersey War Tunnels – Jersey and the other Channel Islands were the only land of the British Isles captured by the Germans during World War 2. This took the form of a five-year occupation, which has left indelible scars on the people and the island itself. 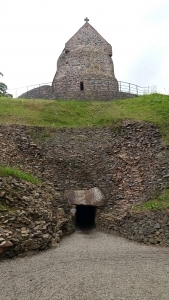 The most significant site from this era are the Jersey War Tunnels which were dug deep into the hillside, running over 1km in length. The tunnels have since been converted into a highly informative museum, which gave us a great insight into the hardships that the island’s people faced during the war. Mont Orgueil Castle – Mont Orgueil Castle dominates the small village of Gorey and has done so for more than 800 years. 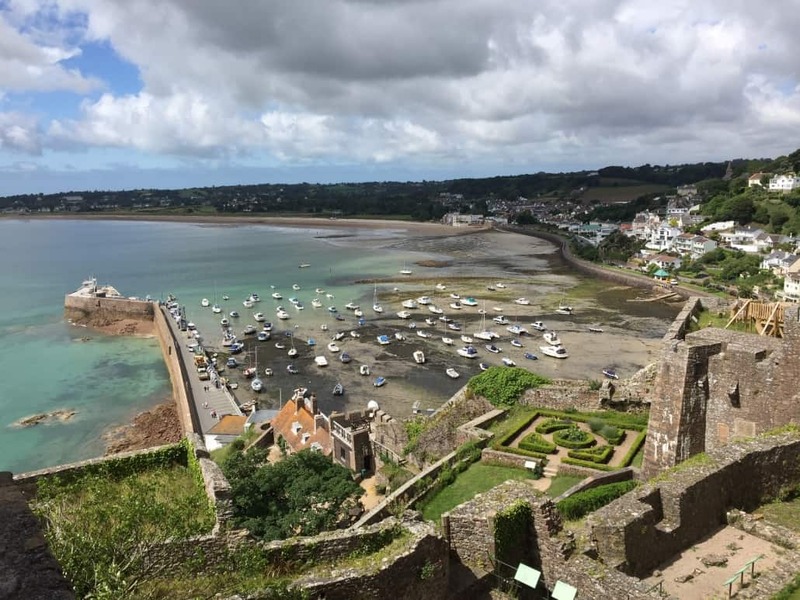 One of the finest examples of a medieval fortress in existence, Mont Orgueil has witnessed many of the key events that have shaped Jersey’s history. 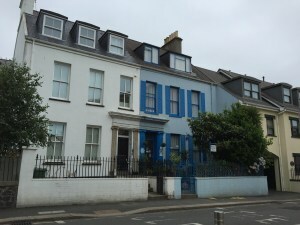 Gorey is easily accessible from St. Helier by bus and make sure you add enough time for your trip to include a wonder around the pretty village and sample one of its lovely restaurants. 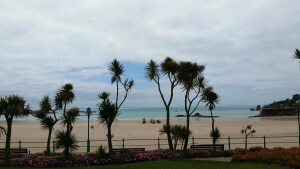 St. Brelade’s Bay Beach – St Brelade’s Bay is set in a beautiful location and it is easy to see why this is Jersey’s busiest resort beach. The bay is very sheltered from everything but onshore breezes. There is soft, golden sand along the entire length of the beach. 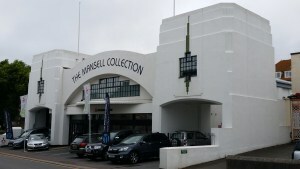 The Mansell Collection – Whether you are a fan of forumla one racing or not, the Nigel Mansell Museum is well worth visiting. It is an entertaining homage to Mansell’s highly successful career and it seems that all his trophies and memorabilia are here on show. Also, of interest for lovers of architecture is the beautiful art deco building that the museum shares with a car dealership. 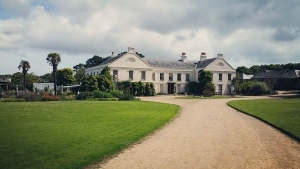 Samares Manor – Just a 30-minute walk from the centre of St. Helier is the attractive Samares Manor and its accompanying botanical gardens. The house itself can be toured at 11:30 and 14:30 during the tourist season, but the real star of the show are the gardens. The present gardens were first created in the 1920s by Sir James Knott who bought the manor in 1924. This substantial work included re-claiming the salt marsh area near the manor. 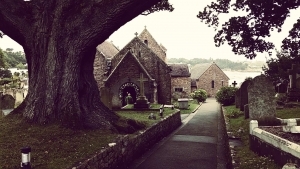 Parish Church of St. Brelade – When visiting the beach at St. Brelade, make sure that you visit this lovely little church. There are actually two church buildings here, the Parish Church, and the Fishermen’s Chapel. 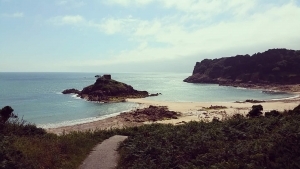 This occupies the site of the original wooden church built by St Brelade in the 6th Century. You can also get one of the best views of the bay from the church yard. 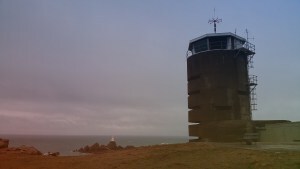 Overlooking the Corbiere Lighthouse, the Naval Tower MP2 looms large over the coastline. Although internal access is not possible, it is only a five-minute diversion on the way to the lighthouse and it gave us an understanding of the scale of German fortifications on the island during World War 2. Jersey possibly has the best preserved German defences in the world. It is also surprising just how many defences there actually were for such a small island until you understand how desperate Hitler was to keep possession of the Channel Islands, so he created a series of island fortresses. Portelet Bay & Janvrin’s Tomb – Portelet Bay will take your breath away as you survey it from the cliffs above. There is a steep public path down to the beach, which is not suitable for all visitors. The focus of the bay is the rock just off the beach. It is connected by a narrow causeway, which gets covered as the tide comes in, so take note of when low tide is, so that you visit the rock. 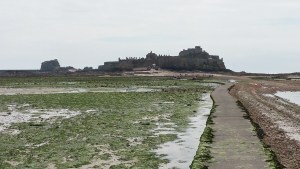 It is worth noting that Jersey experiences some of the biggest tidal ranges in the world, so the tide can come in very quickly and catch you out. 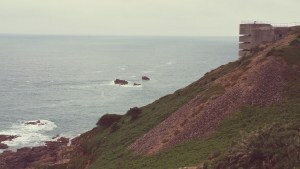 The tower on the rock in the middle of the bay is commonly known as ‘Janvrin’s Tomb’. 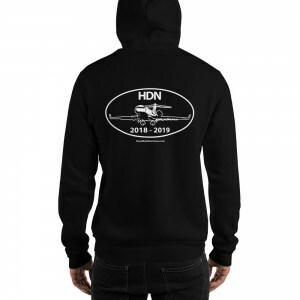 It takes its name from Philippe Janvrin, a sea captain returning to Jersey in 1721 from France. He was not allowed to dock because of fears that he and his ship’s company might bring in the plague. While anchored offshore in Belcroute Bay he fell sick and died, but the worried authorities wouldn’t allow his body to be brought ashore. Instead, he was buried on the rocky islet known as Ile au Guerdain. St. Matthew’s Church – Glass Church – From the outside, St. Matthew’s Church looks quite modest and perhaps a little boring. However, we persevered and on entering we were treated to beautiful displays of Lalique glass. Indeed, no similar commission of René Lalique glassware survives anywhere else in the world. 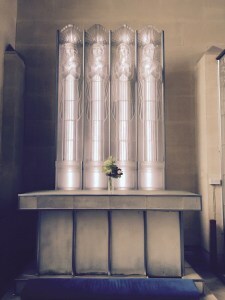 The glassware had been commissioned by Florence Boot in 1934 commemoration of her late husband Jesse, the owner of Boots the Chemist. Battery Lothringen – This is probably the biggest gun emplacement currently open to the public, and is in fact part of a series of emplacements along the headland, most of which can be visited. 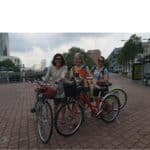 Visiting hours can be a little erratic, as the site is run by a dedicated team of volunteers, so it is best to check online for the opening hours. This impressive bunker was the Command Post (Leitstand) for the naval coastal artillery. The bunker included a range-finder and two periscopes to determine the distance and speed of sea targets. Amongst the memorabilia on show at the site are weaponry, uniforms, communications and cutlery. There are also articles about those in residence at the bunker and many items that depict the relationship the German soldiers had with the island. La Hougue Bie – La Hougue Bie has been described as one of Europe’s finest passage graves and was built around 6,000 years ago. Perhaps surprisingly, you are allowed to enter this ancient site and you are even able to stand up fully within the tomb. There is also a medieval chapel on top of the prehistoric mound, as well as a command bunker built during the German Occupation to the side of the mound. There is also a very informative museum at the site, which amongst other things, displays the world’s largest Celtic coin hoard on display. 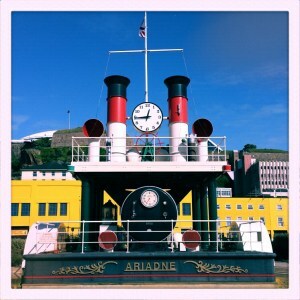 Steam Clock – Ariadne – Listed in the Guinness Book of Records as the World’s largest steam clock, the Jersey steam clock is a full-scale replica of the centre section of a paddle steamboat named the Ariadne. The clock was commissioned in 1996, and is an interesting monument to seek out while exploring St. Helier’s quayside. Unfortunately, it wasn’t working when we visited, but don’t let that put you off! 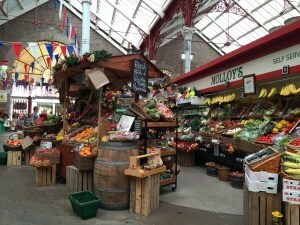 St. Helier Central Market – The Central Market is sheltered beneath the beautiful Victorian high-domed roof. There are fresh fruit and vegetable stalls full of local and imported produce. There are several butchers, bakery and cake shops, with a variety of specialist suppliers around the perimeter where you will find wines and chocolate, a delicatessen and the dairy shop, as well as other unusual goods – all combining to create a cosmopolitan and modern covered shopping area with a difference. 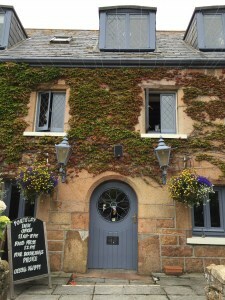 The Portelet Inn – Combine with a visit Portelet Bay and enjoy traditional cooking combined with a great selection of beers! 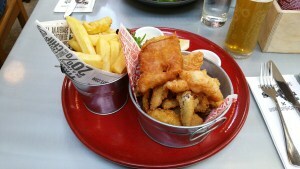 The Seafish Café – A fish and chip shop, but probably unlike any you have visited before. 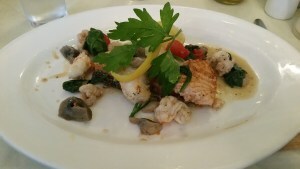 The Seafish Café takes this traditional British dish and other fish dishes, elevating them to near perfection. 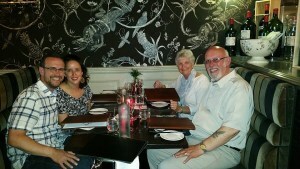 Aromas – This is a popular little restaurant near the St. Helier quayside, serving a wide range of dishes. Banjo – For those special occasions, a visit to Banjo is perfect. This European-style brasserie is set in a former Gentleman’s Club and has the perfect surroundings to enjoy their delightful menu. 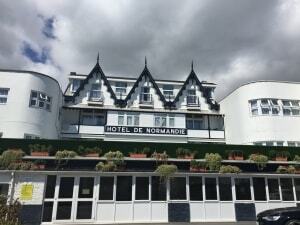 Hotel De Normandie – Moderate Price – Perfectly situated on the scenic St. Clement’s Bay, this hotel is a perfect base to explore St. Helier and the rest of the island. 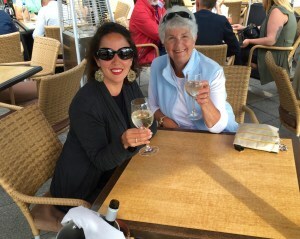 The Royal Yacht – This upscale hotel is in the centre of the quayside area and always seems to be the hub of St. Helier’s social scene, with its popular al fresco restaurant, Zephyr. Electricity: The power plugs and sockets are of type G. The standard voltage is 230 V and the standard frequency is 50 Hz. Currency: Pound (GBP; symbol £) = 100 pence. Notes are in denominations of £50, 20, 10 and 5. Coins are in denominations of £2 and 1, and 50, 20, 10, 5, 2 and 1 pence. The Channel Islands have their own notes – the Jersey pound and the Guernsey pound, both of which are at par with the UK pound. Channel Islands notes, and coins are not accepted in the UK, although they can be reconverted at parity in UK banks. Banks and ATMs: Banks tend to be open between Monday and Friday, 09:30 to 15:30. On the main islands of Jersey and Guernsey ATMs are widespread and accessible, whilst on Alderney there are two ATMs. There are no cash machines on Sark or Herm. Language: English and French are the official languages, however, the use of French is in decline, as is the ancient Norman language of Jèrriais. Religion of the country: The established church is the Church of England, and Catholicism is equally as prevalent. Emergency numbers: Dial 999 for police, fire, or ambulance. Be prepared to give the telephone number you’re calling from. Payphones: There are payphones throughout Jersey and are mainly concentrated in St. Helier. Transport – Buses: Jersey’s small size makes it an ideal destination to explore by bus, with the island’s top destinations from countryside to coastline, family attractions to fine dining all just a short bus ride away. As well as a traditional bus stop, look out for bus stopping points, identified by ‘BUS’ painted in white on the road. 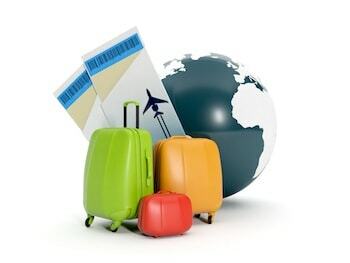 Transport – Taxis: Taxis ranks are conveniently located outside the airport and the harbour; public taxis are meter controlled, and you’d expect to pay less than £20 for a fare between the airport and St. Helier. Different rate tariffs apply to both public rank taxis and booked cabs depending on the time and day and public holidays. Transport – Driving: Drive on the left. The island’s speed limit is set to 40 mph / 64 km per hour. You should hold a Certificate of Insurance or an International Green Card, a valid Driving Licence or International Driving Permit (UK International Driving Permits are not valid). If you’re bringing your car, you’ll need to display a nationality plate on the back of your vehicle. Transport – Ferries: There are a number of ferry services between Jersey and the UK mainland. Condor Ferries offers services from the south coast of England to Jersey and Guernsey with services from Portsmouth, Poole and Weymouth. Condor also has services from St Malo in France to Guernsey and services between Jersey and Guernsey. Manche Iles Express has services between ports in France including Granville, Carteret and Diélette and the Channel Islands including Jersey, Guernsey, Sark and Alderney. Climate: The Channel Islands has a temperate maritime climate with typically warm rather than hot summers and cool to cold winters. Channel Islands rarely experiences very extreme weather meaning Channel Islands can be visited throughout the year. On average the hottest month is August in summer and the coldest is January in winter. Rainfall varies throughout the year with the wettest month being November, December and January and the driest month being July. Cabbage loaf – bread baked between two cabbage leaves. Smoking: It is illegal to smoke in most indoor places other than private homes. Alcohol Consumption: It is illegal for anyone under the age of 18 to be in possession of or consume alcohol. Tipping: It is not customary to tip taxi drivers. Leave a 10% tip following a meal for good service.